Jimmy Brown did it again. 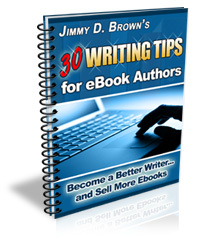 He recently released another free ebook that’s jam packed with 30 tips for ebook authors (you could also use these tips when creating other types of information products such as CDs, DVDs, and membership sites). – 5 Topics to Write About. – 7 Ways to Do Your Research. – 7 Ways to Organize Your Information. – 4 Tips for Staying Motivated.